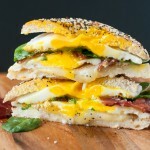 This Everything Bagel Grilled Cheese Breakfast Sandwich absolutely rocks our socks! It's the ultimate breakfast sandwich and we can't help but make them again and again. Slice bagel in half and set aside. While the bacon cooks, fry your eggs: Heat a large non-stick skillet to medium heat and crack your eggs into the pan, separate from one another. Cook for a few minutes until your idea of drippy egg perfection is reached. Covering the pan halfway through cooking [after about a minute or two] helps cook the top of the egg and is my go-to technique for a perfect fried egg! Next butter each side of your bagel [optional] and top with cheese, eggs, bacon, and spinach. Grill it up on a skillet or press into your favorite panini press for a melty breakfast grilled cheese that will rock your morning! Alternatively you can simply toast your bagel and pile it high with the ingredients sandwich-style. There's no wrong way to make an egg sammie; just make one! This bad boy is straight up delicious! Double, triple, or quadruple the ingredients depending on how many sandwiches you need. No need to measure, just use this as meal-spiration and have fun with breakfast!